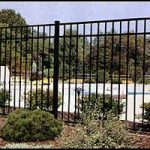 Aluminum Fencing – Precision Vinyl Systems, Inc.
Aluminum Fence. Residential & Commercial. Many styles, sizes & colors to choose from. Thank you for looking at our products to receive a quote please call (570) 636-9878 or you may fax a drawing with your dimensions to (570) 636-3931 be sure to put your name, address, phone number and email address on fax. Thank you! Precision Vinyl Systems, Inc.